Scott Brown believes Celtic showed everyone belong with the elite of European football, despite exiting the Champions League after a 2-0 defeat to Barcelona. Two goals from Lionel Messi ended Celtic’s chances of qualifying for the knockout stages, while Borussia Monchengladbach’s draw with Manchester City erased any hope of falling into the Europa League. 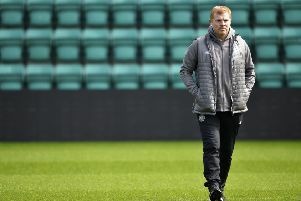 Brendan Rodgers side created chances against their Catalan opponents, including a close range header from Moussa Dembele 90 seconds before Emilio Izaguirre conceded the penalty which put the game beyond doubt. Having given a good account of themselves, and restored some pride following the 7-0 loss in the Nou Camp, the Celtic captain believes the Scottish Champions have shown their worth. He told BT Sport: “We had our chances. It’s not been our day to be perfectly honest. After the last game we’ve dug deep and showed that we can compete in the Champions League. “It’s extremely hard [when you go two down] especially when it’s a soft penalty like that. They’re a good team that like to keep possession and make you run. “It’s a learning curve, especially the first couple of games. We showed our quality and that we can create chances against the top teams.